When you need a street legal racer, look no further than the 2016 Nissan GT-R. Packing plenty of performance in a sporty design, this coupe is ready to take you on the ride of your life. Engineered with plenty of luxury and safety features, you can live the dream in the 2016 Nissan GT-R. The 2016 Nissan GT-R is a mean, aggressive, power-hungry machine. The 2016 GT-R Premium and Black Edition both run on a powerful 3.8L twin-turbo V6 engine. The Gold Edition also runs on a 3.8L twin-turbo V6 engine, but also includes a 45th anniversary VIN plate in the engine compartment. All three models generate 545 horsepower and 463 lb-ft of torque making them already one of the more powerful vehicles on the road. The 2016 GT-R NISMO® operates on a different playing field. 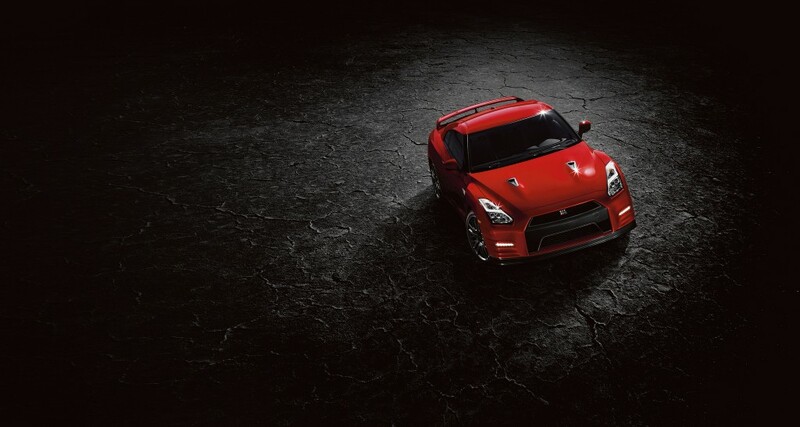 The NISMO® model generates an additional 55 horsepower and 18 lb-ft of torque (600 horsepower/481 lb-ft of torque). This luxury sports car can achieve up to 23 mpg highway and 16 mpg city**. All trim levels operate using a dual-clutch six-speed transmission, giving the GT-R its infamous power, agility, and strength on the road. Don’t let these figures intimidate you – let them excite you. Contact us to learn more about any of the 2016 Nissan GT-R models today! The 2016 GT-R has impressive, luxurious standard exterior features including: Air management-optimized front fenders; UV-reducing solar glass; Dual power folding heated mirrors; LED daytime running lights, taillights, and brake lights; 20-inch RAYS® wheels; Flush-mounted aluminum door handles; Quad 5-inch exhaust fenders; Automatic on/off, multi-LED headlights with signature lighting; and a Body-color rear spoiler. If you want more convenient exterior features, take a look at some of the more advanced trim levels where you can find more exterior features including: 45th Anniversary Gold paint (Gold Edition); NISMO Black 20-inch super-lightweight RAYS® wheels (NISMO); and/or Carbon-fiber trunk lid (NISMO). With performance and an exterior as impressive as the Nissan GT-R’s, you’ve got to have an interior that is equally mind-blowing. The 2016 Nissan GT-R has a premium interior space to keep you comfortable! The 2016 Nissan GT-R comes standard with convenient interior features including: RearView monitor; Leather-wrapped paddle shifters, parking brake lever, and shift knob; Auto-dimming rearview mirror; Leather-wrapped steering wheel with mounted controls; Driver-configurable multi-function display system; Eight-way power-adjustable driver’s seat; Nissan Intelligent Key®; Cruise control; Bluetooth® hands-free phone system; Dual-zone automatic temperature control (ATC); Heated front seats; and Leather front seats with suede inserts. Stay entertained with standard radio and technology features including: Bose® audio system with Active Noise Control, SiriusXM Satellite Radio, 7.0-inch touchscreen with voice recognition, USB connection, Diversity antenna, 11 speakers with dual subwoofers, DVD video playback capability, and Speed-sensitive volume control. On other trim levels you can find interior features such as: 45th Anniversary plaque (Gold Edition); Black/red Recaro® leather-appointed front seats (Black Edition); Black/red interior treatment (Black Edition); NISMO black/red interior treatment (NISMO); Alcantara-wrapped steering wheel with mounted controls and gauge hood (NISMO); NISMO Recaro® leather-appointed front seats with Alcantara® inserts (NISMO); and/or a NISMO tachometer (NISMO). Some of the standard safety features on the 2016 Nissan GT-R include: Nissan Advanced Air Bag System, Tire Pressure Monitoring System (TPMS), Hood buckling crease, Zone Body construction with front and rear crumple zone, Energy-absorbing steering column, and Nissan Vehicle Immobilizer System. Packing a recalibrated suspension and improved headlights for the model year, the 2016 GT-R is a racer you need to drive. With plenty of performance from the handcrafted engine, this car is one for the ages. Built with all the care and detail possible, the 2016 Nissan GT-R is a quick, sporty car you’ll never forget. ** Fuel Economy based on Targeted 2016 EPA fuel economy estimates for 2016 GT-R. Estimated based on Nissan internal testing results, subject to EPA confirmation. Actual mileage may vary with driving conditions.